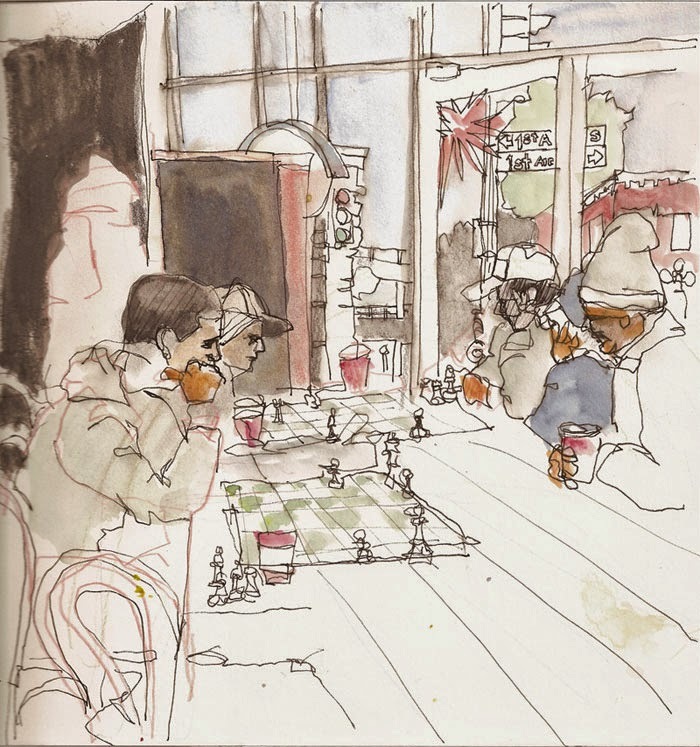 Urban Sketchers Seattle: Yes, definitely COLD . . . Yes, definitely COLD . . .
. . . but sunny and bright so I headed out to the streets. As often happens I thought it wasn't so bad. An hour later after concentrating intensely on the drawing, I started to notice I was starting to shake. So I finished this double-paner as best I could. Fortunately, I had been sitting just outside a Starbucks. As I entered I saw at least 5 other urban sketchers. And there was a couple of intense chess games on one of the long tables. I think these guys meet there regularly. They were really into it. Made me think of Washington Park in New York. Here's a couple of shots of the group.